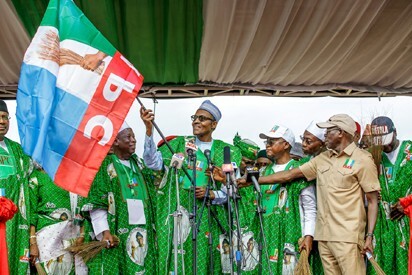 Enugu – The governorship primary election of the All Progressives Congress (APC) in Enugu State has been rocked with crisis following disagreement by the two factions laying claim to the leadership in the state. The disagreement led to the destruction of the public address system on Sunday, while the rear gate gate leading to the mini-stadium of University of Nigeria, Enugu Campus and venue of the event was destroyed by protesters. The protesters who wanted to force themselves into the venue were dispersed with teargass and gunshots. One the factions led by Mr Ben Nwoye ,who is recognised by the national leadership of the party, while the other factor is supported by the Minister of Foriegn Affairs, Mr Geoffery Onyeama is led by Chief Okey Ogbodo. The News Agency of Nigeria (NAN) reports that at the centre of the crisis is the authentic list of delegates for the exercise. Commissioner of Police in Enugu State, Mr Mohammed Danmallam, while addressing the leaders of the factions, appealed to them to conduct themselves in a civil manner. Danmallam said that the police command had deployed enough manpower to ensure a hitch-free exercise. The commissioner of police appealed to Nwoye to accommodate all members of the party in the spirit of fair play and participatory democracy. He said that though only delegates were expected to vote in the primary election but nondelegates could be allowed to observe the process. He said that aspirants from both factions of the party needed to be assured of a level playing field to ensure a peaceful exercise. Danmallam said that the state had been very peaceful, adding that the police command would stop at nothing to maintain the status. Earlier, Ogbodo alleged that their supporters who were among the delegates were denied entry into the venue. He said that it would be wrong for any member of the party to be disenfranchised in the selection of their party govership flagbearer. “I am the authentic chairman of the party in the state and no one has the right to disenfranchise my supporters,” Ogbodo said. However, Nwoye said that he was the legitimate chairman of the party, adding that Ogbodo wanted to introduce touts who would disrupt the exercise. He said that only duly accredited delegates would be allowed entry into the venue. “Ogbodo is not even a delegate but he can be allowed to observe the process as a chieftain of the party,” Nwoye said. NAN reports that as at the time of filing the reports members of the electoral committee were yet to arrive the venue due to the uncertainty surrounding the crisis.